On YOB's 'Our Raw Heart,' The Lightness Is Devastating After a near-death experience, the doom metal trio's sprawling gravity and thunderous majesty takes an introspective turn. YOB's Our Raw Heart comes out June 8. 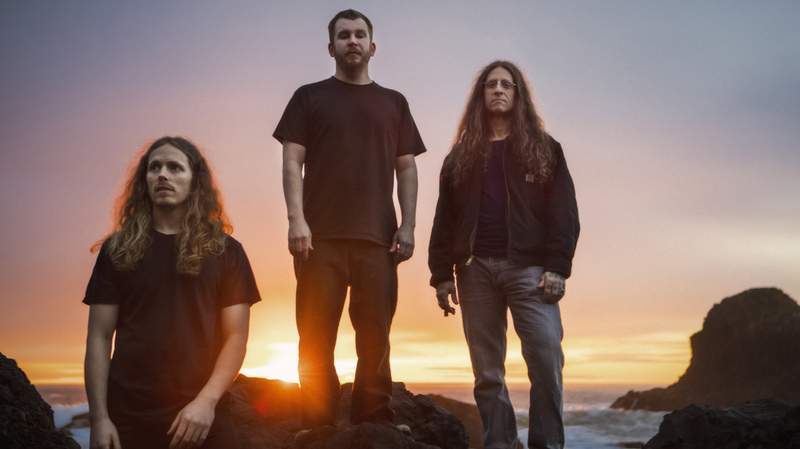 In an interview with Cvlt Nation last year, Mike Scheidt didn't dwell overlong on the mammoth riffs or cosmic heft of his veteran doom metal band YOB. He talked about life and death. "Definitely a little bit of a perspective shift in my life," he said of the six-hour surgery he underwent in early 2017 as treatment for acute diverticulitis, an intestinal disease he'd contracted. The surgery was supposed to last only three hours, and Scheidt awoke from his ordeal knowing he'd faced mortality. "Some things have come into real crystal clarity, and it's positive. Yeah, it's positive. Also, things I need to work on have become apparent to me, but not in a bad way. It's seeing it as an opportunity." That opportunity has been realized in YOB's new album, Our Raw Heart. It's the eighth full-length by the Eugene, Ore.-based trio, and the group's sprawling gravity and thunderous majesty have taken an introspective turn — but not in entirely death-obsessed way. When Scheidt, who sings and wields the guitar in YOB, utters the lines "Unknown by time / This ache of beyond / Shining" on Our Raw Heart's opening song, "Ablaze," the magnetic pull of the hereafter is palpable. Choppy and churning, it's a fraught voyage into the reaches of metaphysical uncertainty. Scheidt delivers poetic awe in melodic howls, summoning an atmosphere of spiritual surrender for the duration of the track's 10-minute expanse. Equally lengthy but far more harrowing is "The Screen." Scheidt's staccato riffage is offset by the methodical, molasses-paced pummeling by drummer Travis Foster and bassist Aaron Rieseberg. "Until the pain has bled out," Scheidt cries, and an otherwise fantastical tale about an "ancestral rusted blade" takes on metaphorical depth. Acute diverticulitis is a notoriously agonizing disease, and Scheidt channels his ordeal into a gut-rending saga of perseverance. Similarly, the lurching track "Original Face" catalogues a procession of body horrors, from stretched skin to leeched blood. Then Scheidt resolves his fugue of anguish by citing the Tibetan Buddhist idea of Rigpa, which lends an air of meditative transcendence to the song's wounded savagery. "In Reverie" and "Lung's Reach" are a pair of linked tracks, and they're the album's most dynamic. From Rieseberg's infernal bass frequencies to the hovering menace of Scheidt's distorted guitar, the songs lull and swell like a hellish ocean. But it's the title track of Our Raw Heart that evokes the most imagery and emotion. As Scheidt sings of a force "beckoning my restless ghost," the band carves out a tuneful, psychedelic dreamspace that falls somewhere between Torche and Baroness — while nodding to godfathers such as Black Sabbath and Pink Floyd. Going through a near-death experience on an operating table is enough to toughen up anyone. Instead, Scheidt uses it as a wellspring of vulnerability. On the album's longest track, "Beauty In Falling Leaves," he deploys clean-toned guitars and clear-throated vocals, venting his soul and contemplating eternity without the benefit of YOB's usual deluge of sludge. The heaviness does kick in, of course, but when it does, it buoys instead of bashes — and that lightness is devastating. "To me, the fact that we can a breathe air, that our hearts beat themselves, that our lungs breathe, that we can inhabit these spacesuits and be here in itself is this inexplicable phenomenon," Scheidt remarked. "It's not useful in a worldly sense, but it's important to me to bear it in mind."